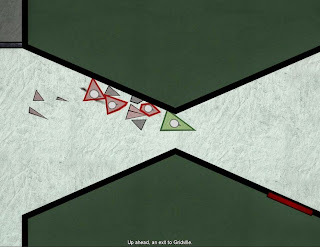 Flatland: Fallen Angle is a brilliant free game, one that features a very original aesthetic and a story that seems to clash entirely with the visuals. If we’re looking for a game that could be compared to this one, then that game is the acclaimed Thomas Was Alone. Here, instead of squares we’re playing with triangles. At first sight one could never imagine that behind the triangles there’s a noir story, a tale of revenge that is made the more special since the main character – I mean, triangle – is the narrator of the on-screen action. While we escape from the initial room, eliminate enemies by bumping onto them or speed past others, we’re treated to some great voice acting and a particularly amazing script. Gameplay isn’t at fault either, with the exploration of the geometric landscapes and the attacking and avoiding triangles getting pretty exciting, especially when you have your minions to help you deal with the hordes of attackers. This is a game that ranks extremely high in originality and that is a real gem, one that could only be created in the media that is the videogames.